Happy 1st birthday, baby girl! You have made us laugh, cry, enjoy and be afraid, all at the same time! We love you so much, happy birthday! Heyo! 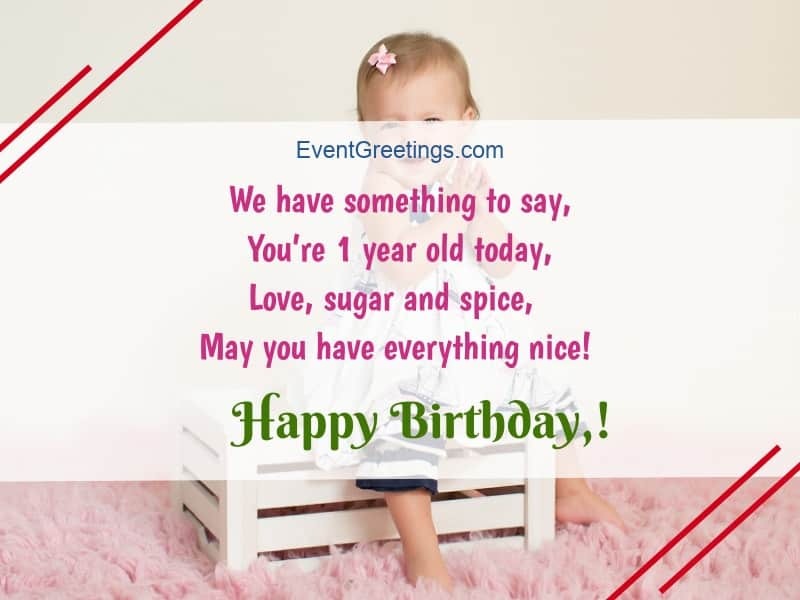 It’s your first year on this world and we hope it was the best! Happy birthday from mom and dad, and here’s to more love and happiness! You are growing fast before our eyes, and we cannot believe a year has passed! Happy birthday, little one, hope you accomplish everything you dream of! Happy birthday to our 1-year-old birthday girl, munchkin, doll, sweetie and teddy bear! We love you so much, please always be this happy! May you have everything nice! A year goes by too fast, and we hope we gave you enough of ours to make you happy! Have the best first birthday, little lady, Mommy and Daddy love you! One stands for: one love, one life, one family, and one year old today! Happy birthday to our favorite baby girl! You made us the happiest parents in the world! You are at the doorstep of your life, and I hope each year bring along a new adventure for us all! Happy 1st birthday, little missis, mom and dad love you! You can now eat with your hands and make all the mess you like! Happy first birthday, baby girl, we are so lucky to have you! You are in for a long line of birthday wishes, but today is your first! 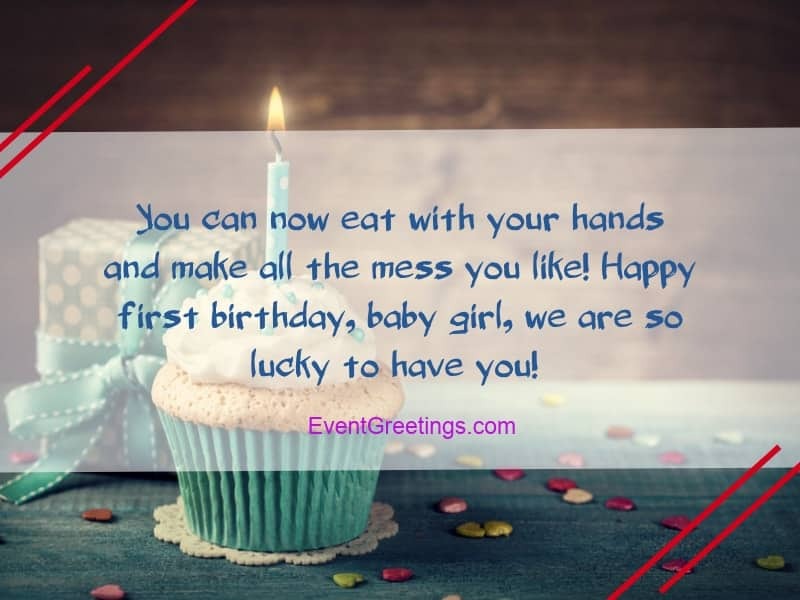 Have the best first birthday ever! Love, your parents! Our baby girl is 1 today and we couldn’t be more thrilled! 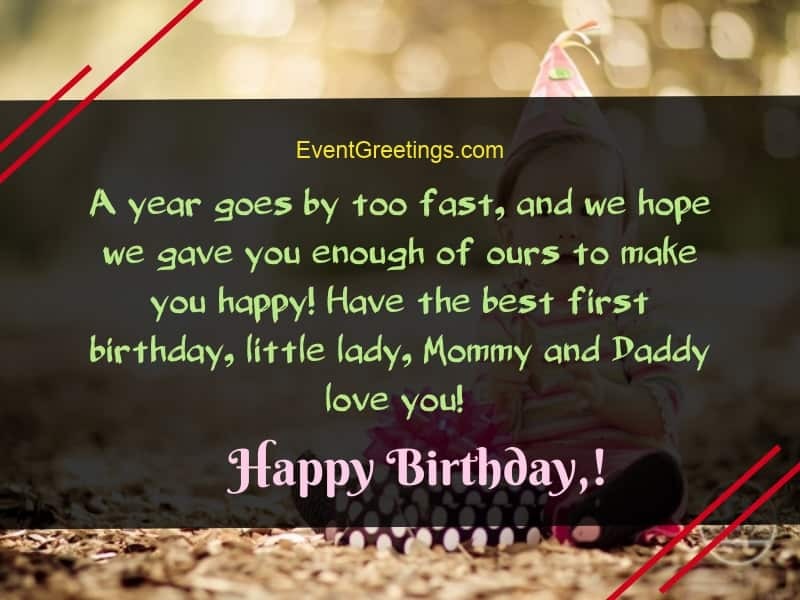 Here’s to many more birthdays filled with happiness, love and joy! In time, you will learn that you cannot wipe off cake from your dress. But, for today, enjoy being a sweet baby girl turning 1! Mom and dad wish you a happy birthday! Hey, next time you wake us up at 3 a.m., make sure you’re at least happy about it! No tears on your first birthday, or ever! Happy birthday little princess, we love you! You are a grown up girl now! Happy first birthday, we love seeing you smile every single day! Love, mommy and daddy! A year ago, on this day, God has given us the best gift of life and it’s you, my baby girl. Happy 1st birthday! Be blessed and happy forever! My doll, congratulations on your 1st birthday! For me, you are a blessing who have given me the identity “mother”. All the love and affection for you, my baby! The happiest moment of my life was when I saw you for the first time and took you into my arms, my baby girl. I forgot all the pain and cried with joy. One year has passed and I’m so happy for you. Happy 1st birthday, dear! Happy 1st birthday, my little munchkin! You are the most important part of my life. I’m really lucky to have you in my life. Love you a lot. May this day come again and again in your life! Congratulations my doll for successfully completing one year! Thanks for coming into my life and I promise I’ll do everything for the welfare of your life. May God give you all the happiness of the world! One year has passed since you arrived into our lives and I can’t explain how happy I am to see your healthy growth. Happy 1st birthday, my love! May God protect you forever!